1. 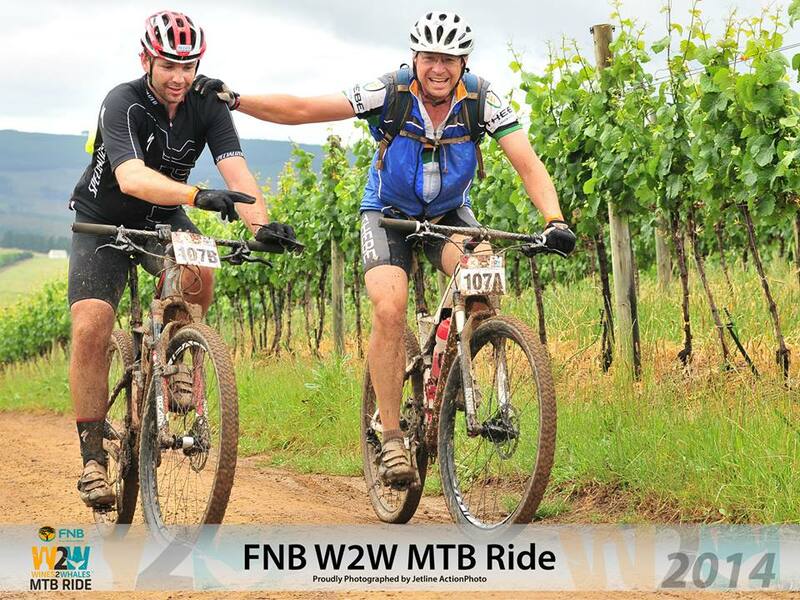 I have been a bit lazy lately after two awesome stage races (Swazi Frontier & Wines2Whales). Riding on plot roads begs significant discipline & motivation neither of which I have in abundance at present. 2. I saw a poster for a 60km (4x15km laps) race in the newly established Buffelsdrift MTB Park North of Pretoria near Roodeplaat Dam. Haven’t managed to get there yet so it presented an opportunity. I expected it to be a smallish event. 3. The entry fee was low and the event was to benefit the Rotary, so a good cause and all that. Three good enough reasons. Race on. Fortunately I am not competitive at all 🙂 so the strategy was simple, pretend you are only there to make up the numbers and do a social ride, then wait until the real racers have escaped, after the usual 500m from the start … then start racing the other social rider in front of you, that is, the other one also left behind. The field was rather compact shall I say, the starter was able to address us without the usual electronic aids and he counted out loud from 4 downwards to signal the start. For the first time in a long while … a very long while … I was able to keep up with the top guys after 500m, all of them packing the usual hard tail bikes, well tanned & oiled legs and youth. I took my rightful position at the rear, initially for fun’s sake but shortly thereafter I realized with a small field and no-one to follow and few tracks to see, I’d better keep up so I didn’t get lost. I couldn’t but at least did long enough to be able to see someone in the distance. There was off course some very enjoyable riding. Buffelsdrift is a great venue and I’ll be back there for sure. Back to the race. For most of the the race I rode on my own, other than passing the odd non-racing social riders … in the usual race way … sneak up on them, breathe deeply and sprint pass as if it’s your normal pace. It worked mostly … until I caught up with three riders, one of them on a fat bike. They looked rather impressive, the looked strong & fast. They weren’t racing, social weekend riders, just on the same course. At first I thought I’d follow their wheels, but I’m “racing” and I’m NOT competitive remember … so I performed the passing method. It went pretty well actually, except I kept hearing funny noises behind me, I suspected it was the fat bike, obviously in the hands of a rather competent rider, off course I pretended to not notice. I see on Strava during this episode I rode a segment in the 9th best time of 392 previous riders, I was clearly trying to shake off the fat bike, which I eventually did … 3km later, when he pulled off to wait for his other 2 friends. I pretended I was the stronger one but I had clearly been upstaged. So at some point we got to the finish, I was told I finished in 7th place, an elusive Top 10 placing at last! For a moment I had flashes of Rio 2016 and a wild card invite to the Tour de France, that was until reality set in and I remembered we were only 10 at the start and I noticed one rider had pulled out after I had completed my 3rd lap. In the end it was a very enjoyable experience all round, it’s why I ride my mountain bike, so I can escape reality in any form or shape and allow my mind total freedom to enjoy like a child, pretend to be whoever I want to be at that moment in time, to indulge into micro battles and to enjoy what nature has put on offer for this day, all of these contributing to making a few more precious memories. – So the final day finally arrived, we were all sad, too much fun this race. – As per yesterday dunno distance & time, no watch, only brought the fun-o-meter. I think 70km or so. 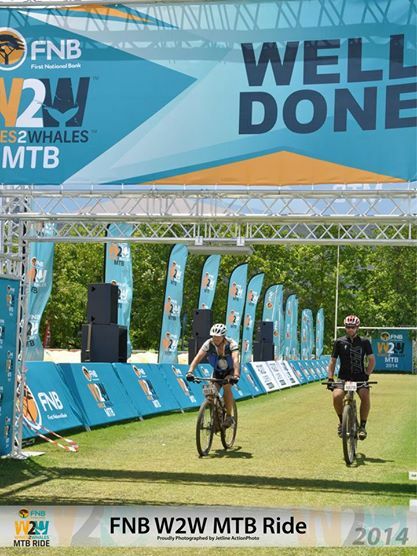 – Our new friends Gavin Cowden & Driekie Heyns were not in the starting line. Driekie crashed & broke her collar bone 400m from the finish on Day 2. She is a strong & accomplished rider, her incident testimony to a course that can give & take in equal portions. We are sad for them but she’ll be back stronger than before. – A glorious day greeted us, blue skies & sun, another perfect riding day. – More single track, more bridges, more berms, more bliss. – Last night we were introduced to the 4 full time trail builders, young men from the local community. They got a standing ovation from 1200 riders. How apt & well deserved. – The landscape changed from orchards & vineyards to rolling wheat fields as we descended down Houwhoek Pass. – The views over Walker Bay were spectacular as we shared the ridge above Hermanus with para gliders ridge riding the onshore wind. – I have run out of descriptive words for Wines2Whales. Maybe if you can Google “synonyms for Brilliant” & just insert them into this bullet point, it’ll do justice. – Im sad to be finished, very thankful for no issues, grateful to a great partner Brian Bear & I leave with fantastic memories. – Next year, its your turn! – I don’t know how far it was or how long it took. No watch today. It was between 4-5 hours, there were clouds when we started & the sun was above when we finished. – Beautiful day, breathless, short on descriptives! – Overnight rain “softened” up the mud so it was a slippery day. – Single track. 70% of 67km was single track, perfect single track! – Berms. Lots of berms! Small ones, big ones, fast ones and frightening fast ones. Brilliant! – Bridges. Most bridges ever, exiting into big berms, then more bridges, simply incredible. So much effort. Much appreciated by all. – Sections with names! Pufadder, Amphitheatre, Boomslang. – Tight switch backs, down hill & even uphill, tests every bike skill in the book. 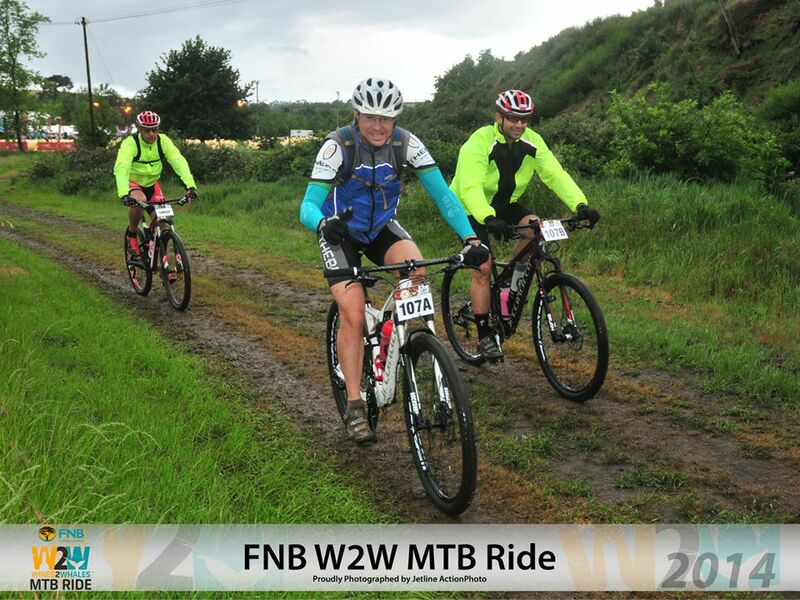 – W2W is a truly world class event with some of the best mountain biking & scenery you will ever see! – Daddy, please can I stay another 3 days? – One of the most beautiful days ever on a MTB. – Like riding through a painting into a next painting. – Amazing single track, flowing & fast & lots of it. – Could easily be the best organised event in the country. – Brian Bear & I rode like olympians but so did many others. I do think we enjoyed ourselves most of all. – Portage over Gamtouw Pass is simply mindblowing. Breathtaking views over False Bay & wagon tracks from hundreds of years ago. – Test bike from Lynnwood Cycles, Epic Comp Carbon was brilliant! Thanks again. – Spur burgers, choc milk & cappuccino at the finish! How awesome is that? – Nou … gaan ons rus!